As you might have noticed from recent pictures of Oscar, he is battling a skin condition. Oscar has sarcoptic mange. This is the second time we have dealt with sarcoptic mange on Oscar, so I want to share what we’ve learned. I have avoided discussing Oscar’s mange because, well, I’ve been embarrassed to talk about it. “Mange” is such an ugly word, and I’ve been worried it will sound like we don’t take good care of Oscar or that we haven’t cleaned him or our home enough. However, battling the sarcoptic mange has been such a struggle that it feels worth discussing if it helps someone in the same position. This has been a long process for us, so I will first discuss how we diagnosed the sarcoptic mange, then follow up to discuss our treatment plans, and finally discuss what we wish we would have done differently throughout the mange treatment process. We discovered the mange through two different symptoms: scratching and skin discoloration/scabbing. Healthy Oscar with mostly pink skin and no scabbing. Oscar with skin discoloration and some scabbing on his ears, snout, and legs from the sarcoptic mange and staph infection. 1) Scratching. The first time Oscar had mange was right after we brought him home for the first time. We took him to the vet a week after getting him, mainly for an initial checkup but also because he was scratching a lot. He didn’t have any visible skin issues or other concerns, just constant scratching. It can be difficult to know if a mini pig’s scratching is normal or if it’s mange because pigs love to scratch. 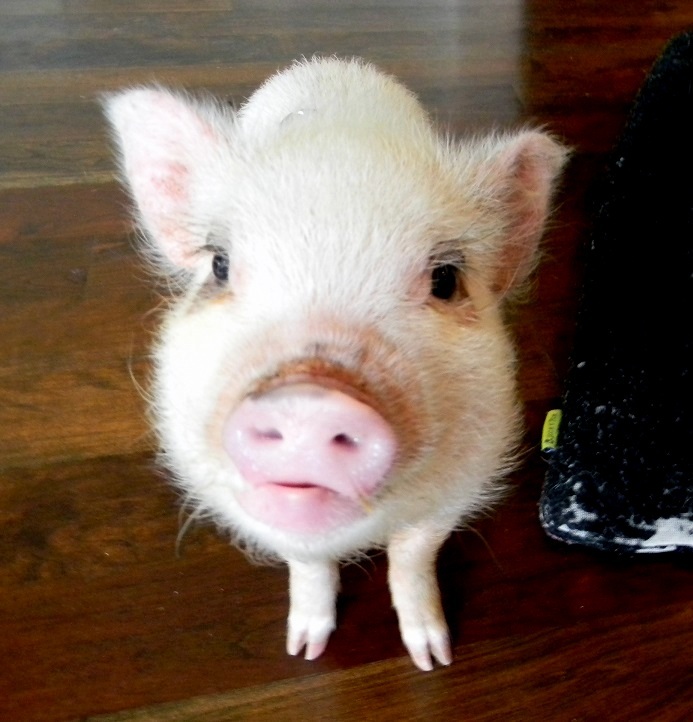 Mini pigs will frequently rub against furniture or people to scratch, so don’t immediately panic if you see that behavior in your mini pig. In my experience, what you want to watch for is obsessive scratching. If your mini pig scratches occasionally but will walk away and engage in something else, she might have normal piggy itches. If your mini pig is constantly scratching against furniture, walls, or anything she can rub against and has trouble engaging in anything but scratching, you might be dealing with mange. 2) Skin Discoloration/Scabbing. The second time we realized Oscar had mange was about a month and a half after completing the initial mange treatment. Although I say Oscar had mange twice, I believe the mange either didn’t completely clear up or he was reinfected from the first mange issue. This time Oscar’s normally pink skin looked brownish and scabby, but since he is our first mini pig, I didn’t know if this was normal or something concerning. To make it more confusing, the brownish coloring would even wipe off with a towel to just reappear a few days later. Oscar at 3 months old with clear, pink skin coloring. Oscar at 4 months old dealing with sarcoptic mange, resulting in discoloration and scabbing on his skin. I decided to take him to the vet just in case and, after a skin scrape, found out that he again has sarcoptic mange and a staph infection, which can often accompany the mange. If you notice that your mini pig has skin discoloration or scabby patches, I recommend taking him to the vet to determine if it’s mange or something else. There are other potential reasons for skin discoloration that can be confused with sarcoptic mange. Some light discoloration can be “pig rust” and is normal and just wipes right off. Also, these same skin symptoms can be attributed to “greasy pig” disease, so it is best to have your vet do a skin scrape before treating your mini pig. I will follow up with the treatments we have used for Oscar and what has worked (and not worked) for us so far. Note: This has been our personal experience with diagnosing and treating mange. The information presented on this web site is not intended to take the place of your personal veterinarian’s advice and is not intended to diagnose, treat, cure or prevent any condition. Discuss this information with your own veterinarian to determine what is right for your pet. All information is intended for your general knowledge only and is not a substitute for veterinary advice or treatment for specific conditions. If you are looking for a more technical description of mange, I recommend this site. How long did it take Oscar to clear up and did Any of you get it from him and if so how did you deal? Hi Katie! The second time we treated Oscar, we had him isolated for 6 weeks and that’s how long it took for us to get rid of the mange. I think the mites technically died after the first or second Ivomec treatment, but the vet recommended we keep him isolated through the third treatment just in case. It was even a month or two after the 6 weeks before the scabbiness on his skin really went away. We got some very light rashes from the mange that itched a moderate amount, but we didn’t treat them and they went away pretty quickly on their own. So, that part wasn’t a big deal for us. I’ve heard of some people going to their doctor and getting something to put on the rash if it is too itchy, but ours wasn’t that severe or bothersome. Hope that helps! Elvis has the same thing. I can wipe his belly and legs down and he will have the “rust color” the next day. His vet did a scrapping, but it didn’t show anything, but she is treating him for it. I feel awful for my baby. My husband and I are suffering just as much as Elvis and I went to my doctor and received a shot which didn’t help. I have tried pills and creams and nothing seems to help. The best thing that helps is called Unkers. It gets really cold when you put it on, but it’s the only thing we have found to give us any relief. We have put it on Elvis’s legs too to help wiht the itching. I just do the best I can not to scratch. How did Oscar handling being isolated because Elvis does not tolerate it at all!!! We have not found a baby gate that is Elvis proof. He has to sleep with us. If he’s not in his pile of blankets in the living room, he is in our bed taking a nap. How many total treatments of meds did you do? Ugh, sorry you and your husband and Elvis are dealing with it. It’s one of those things that you will all fully recover from of course, but it’s pretty miserable going through it. I’m glad everyone is getting treated. We were lucky and my husband and I didn’t have much discomfort aside from a few slightly itchy spots, but I’ve heard it can get really uncomfortable. I’m glad you mentioned Unkers is case someone finds your comment and gets some relief from using it. For Oscar’s second round of mange treatment (which was the successful treatment), he had three Ivermectin injections, each 14 days apart. We didn’t have much luck with the oral Ivomec, but some people are able to treat it that way. The isolation felt like the hardest part for me. Oscar was so young then, and I felt like we were really setting him back in terms of socialization and bonding. All things considered though, he handled the isolation better than we did. He had some screaming fits (partly from being isolated and partly from just being young), but he kept in pretty good spirits. He stayed behind his baby gate (we have a pretty tall one that kept him in), and he sleeps in his crate so he didn’t mind sleeping in his isolation area as long as his crate and blankets were in there. We “cheated” a few times with the isolation where we got him out and cuddled with him, but we made sure to wear long sleeves and pants to avoid getting the mites ourselves (mainly because we didn’t want to get them and then transfer them back to him and reinfect him), and we washed those clothes each time after they touched him. I’m not recommending the “cheating” but just saying that’s how we handled it when we broke down and gave in. We tried not to let him touch any rugs or surfaces during his isolation that the mites could transfer to and then transfer back to him or us or the dogs. It was a really tough time, and I’ll be honest that I shed more than a few tears of frustration while we were going through it. Hopefully Elvis will adjust to his isolation space (maybe there are ways to entice him into enjoying his isolation area?) and do okay in there during his treatment. The positive that I kept reminding myself is that, once the mange is treated and completely gone, you shouldn’t have to worry about it again unless he’s in contact with other pigs who have mange (at least that’s my understanding). It’s definitely a tough time though, so I feel for you! I got a mini pig at a local fair in about 2001. I developed a hideously itchy rash. So did my pig. I went to my Dr several times, (the vet also) and he said it was psoriasis. The vet never did a skin scrape on Bubba. I also noticed my poor little pig itching insanely. I had no idea what mange or scabies was since this was also my 1st piggie. I got a book about pot bellies. I had to self diagnose both of us. Thankfully, Bubba and I were the only ones in the household who got it. My sons didn’t and neither did my 20 other pets but Bubba and I went through hell. I’ve had several pigs since. Now I know what to do. I recently just got Ozzy! Good luck to you and Oscar. They are the best pets you could own. Hi, as always very helpful. But I have a black pig…I don’t think I would be able to see the rust color on his skin if he had it. I have seen an increase in scratching so I am feeding and rubbing on coconut oil. Of course I can always go to the vet but I feel I am being paranoid. My question is about your symptoms. The scabing you mentioned looks like a human cut that scabs over? Just random scabs on the pig or in select areas like their ears? Thanks!!! That’s a good point because I’m not sure if you would be able to see it on a black pig. I know with Oscar, we can see it more if we kind of part his hair/move his mohawk out of the way, but that still might not help you. The scabs are hard to describe, but with Oscar’s they started in a few places and then eventually started spreading to more of his skin. Not sure if it’s the same for everyone, but he had the most scabbing at first on his ears, snout (looked more like thick rust instead of scabs on his snout), and on his little legs. Eventually, it spread until it was on his body too. This might be wrong, but I think the scabbing was more a side effect of his staph infection which was secondary to his mange. That’s probably right about them being almost like a human cut that scabs over. It’s not exactly like that but close, and Oscar’s skin was visibly scabby and felt rough and patchy (again, probably more from the secondary infection rather than the actual mange). I can totally relate to mange paranoia! After Oscar was treated for his mange, I was constantly obsessing about every scratch of his and worrying that he had mange. One thing to keep in mind is that you will typically see mange right after they’ve come home or if they’ve been around other pigs since it’s spread through other pigs. It is technically possible for them to be carriers of mange which would come out when they’re stressed but, according to my veterinarian, that is rare. One thing to watch for is if his itching is obsessive or just occasional. 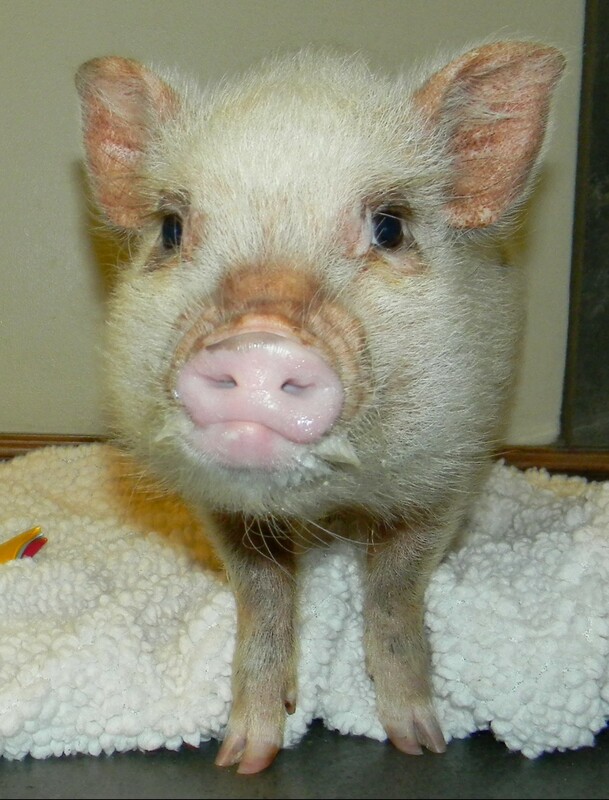 Pigs are just itchy in general which makes it harder to diagnose the mange, but Oscar was obsessively itchy when he had mange…like scratching on furniture, walls, people, anything he could find. These days, he stops and scratches every once in a while, but it’s far from obsessive. My husband and I have been insanely itchy for a few months and I can’t figure out why. I have ruled out bed bugs and we live with 3 other people who aren’t having this problem at all. Recently changed all the bedding in case it was the synthetic down or sheets because I can’t remember when we got them and if it’s when it all started. No changes in detergent and I don’t think allergy because the slim odds both hubby and I have the same allergy. We have a pet pig, he’s been treated for mange and shows no signs of it. He’s itchy but you can see the snow of dry skin so I think that’s all with him. He’s had mange before so I know the symptoms. Has anyone ever heard of anything like this? I feel like it’s something with the pig because nobody else in our house cuddles with him like us and we are the only ones itchy. I love all of this! I’ve got mites all the time in one place or another. We work her regularly and use ivomec. Punkin is a mini pot belly and is white with black spots. She has very scaly skin. I brush her on a blanket and it’s just covered with dead skin. Is this normal? I don’t have a vet close that will take her and I actually can’t get her in the car. She is about 80 pounds. Thank You for all of these posts! I almost always have mites on me from my baby, Punkin. She is a mini pot belly and is white with black spots. Her skin is extremely scaly. When I brush her I do it on a blanket and it will be covered with dead skin. Is this normal? She was literally handed to me for Christmas 19 months ago and Im learning as I go. I dont have a vet around here that will take her and I cant get her into the car anyway! Shes about 80 pounds. Is there something I need to do to treat her skin? Is it mange? I recently became a mini pig owner. We named him Benjamin aka Benji and when in trouble we call him Benjamin Franklin. My daughter and I noticed every time we held Benji we were extremely itchy. We even thought we could be allergic to me but then he started scratching on everything. His hair started to shed badly. We had took the vet before this all started and everything came back fine. I started to look up what it could be and when mange popped up, I freaked out. We don’t have the money at the moment for a visit to make sure so I’ve been keeping him isolated. I gave him a bath and a rub down in coconut oil. He doesn’t have any crusty stuff around his nose or eyes at the moment. I feel so bad because I miss holding him like when he first arrived. I found your site to be very helpful. I’ll be taking him to a vet very soon because I don’t want to be unhappy. Also how did you stop your own symptoms? Has Benji been dewormed? Check out the american mini pig website for the correct dosage to give. Lots of great info on there for piggy parents. There are 2 types he should receive, and it should be done every 6 months. I hope this helps. Where can you buy unkers? I think I itch more than Wilbur. Try amazon. I can purchase it at my local hometown pharmacy. Best stuff ever. I have a mini pig named Oliver. I got him when he was just weaned. He is 7 months old and weighs 56#. He has a slight greasy spot on his Mohawk. Is this normal or do I need to get him to the vet?